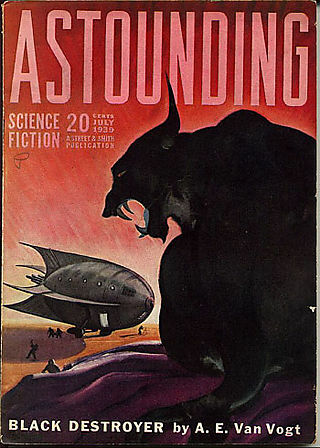 Most long-time fans of science fiction consider the Golden Age to have started with the July 1939 issue of Astounding Science Fiction. In that issue was the first Astounding story by Isaac Asimov (“Trends”) as well as A.E. Van Vogt’s first story, “Black Destroyer”. The very next issue included Robert Heinlein’s first story, “Life-Line”. This incredible run of stories and new authors who eventually became giants of the field continued for ten years. I have always been envious of those people who got to live through these years as youngsters, pouring over each issue of Astounding as it came out. Sure, they lived in dark times, with war in Europe and eventually involving the United States. But science fiction earned its stripes during these years and reached a peak which I don’t think has been surmounted since. I daydream about summer days in the early 1940s, sitting on a stoop with the latest issue of Astounding open on my lap, and it is as close to heaven as my imagination allows me to get. It occurred to me not too long ago, why not take a vacation in the Golden Age of science fiction? How does one vacation in the Golden Age? Well, I have this idea… I plan on obtaining each issue of Astounding from July 1939 to December 1949 and then reading them cover-to-cover, as much as possible in the order in which they appeared. I’ve already obtained the July 1939 and August 1939 issues, and I have in my collection about half a dozen other issue from that era. Over time, I plan on getting a complete run of the issues that made up the Golden Age. Obviously this is a long-term effort, but I can’t quite put into words how much the idea excites me. It is a vacation only in imagination, of course, but I look forward to those brief intervals throughout the week in which I can set aside whatever it is I am doing, and sit for 30 minutes or an hour, flipping through the pages of Astounding, reading the issues in the same way and the same order in which Isaac Asimov read them, in which Clarke and Heinlein and Sturgeon and Kutner and Moore read them. I look forward to reading the original FOUNDATION stories as they first appeared; to reading Del Rey and Hubbard; to reading the original serialized version of Van Vogt’s “The World of Null-A.” I look forward to reading Campbell’s editorials, and the science essays and Brass Tacks and reviews that appear in the magazine. I look forward to skimming the ads, Bob Hope telling me not to spend my extra cash, but to buy war bonds instead. And of course, I look forward to sharing the experience with you on this blog over the coming months and years. I’ve read many of the stories that appeared in Astounding during this era, but the truth is there are many more that I haven’t read. Absent a time machine, this is as close as I will ever come to living in the Golden Age of Science Fiction and I can’t wait to get started. ETA: (5/13/11) Here are all the posts to-date. And here is a schedule for all future posts. Hey – nice idea if you have the budget to support it! Some of the issues from that period are considered to be pretty collectible and have correspondingly high prices. I would MUCH rather see you devote the bucks to the development of a working time machine so that we can ALL visit the Golden Age for real! I’d love the time machine, believe me. Have you ever read Michael A. Burstein‘s story “Cosmic Corkscrew” (Analog, 6/98)? It touches on this theme. I love this idea. Don’t forget to read the letters columns, so you can feel connected to the fan squabbles of the day! Monty, I am equally excited about the letter columns. I’m interested to see how, over 10 years, readers react to a newcomer like Asimov and Heinlein, and watch them evolve into reader favorite and superstars. I’m where Asimov was just prior to July 1939: 2 pro stories published so far, and one coming out in Analog in June. Isn’t it funny, as SF fans, we’re inclined to “take a vacation” in the 1940s by reading what they thought the 2000s would be like? All these authors from Asimov to Zelazny, would probably rather have taken a vacation to 2011–and seriously puzzled over someone using a worldwide network of computers to look back at them instead of looking forward to, what? Our next family trip to Mars?